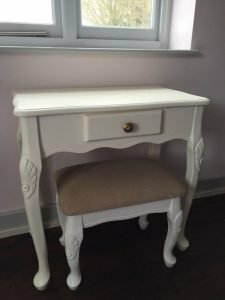 A small hand painted white solid wood vanity dresser and matching stool, the stool upholstered in light brown fabric. 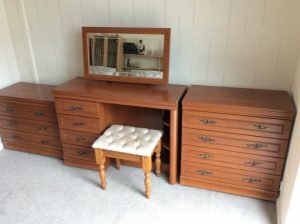 A solid wood vintage bedroom furniture set, to include a large dressing table, a dressing stool and two chests of drawers. 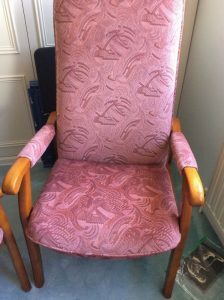 A pair of high back vintage armchairs on solid pine bases, upholstered in patterned pink fabric. 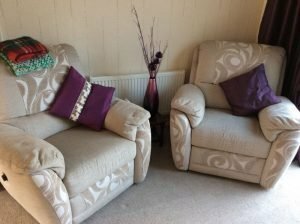 A pair of high back reclining armchairs on castors, upholstered in cream patterned canvas fabric. 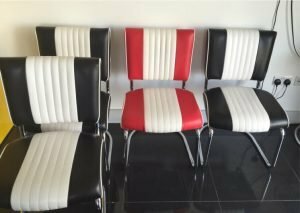 A set of four retro style low back vintage dining chairs, three upholstered in black and white leather and one in red. 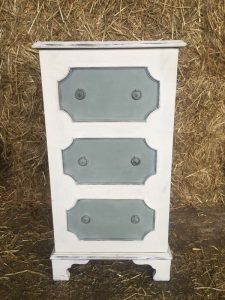 A hand painted white and grey solid wood chest of drawers in the shabby chic style, having three drawers. 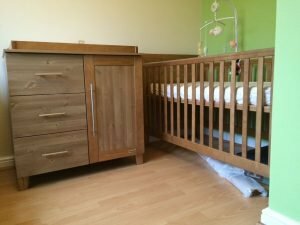 A solid wood baby convertible bed cot, together with a baby changing storage unit. 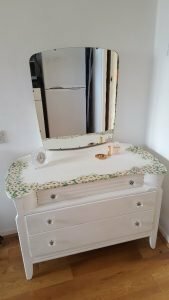 A white solid wood vintage vanity dresser, having a large bevelled mirror above three drawers, hand painted with a floral design to the top. 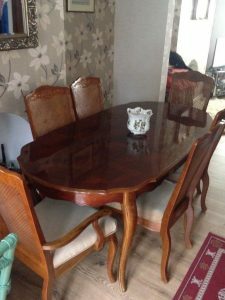 A large solid mahogany extendable dining table, together with six carved back dining chairs. 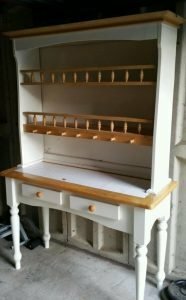 A tall standing hand painted white solid wood kitchen dresser, having two shelves above six small drawers and a double cupboard. 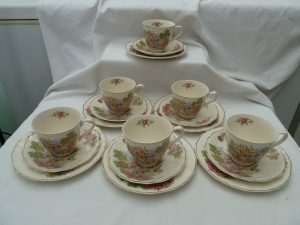 A collection of floral and cottage patterned fine bone China teacups, saucers and side plates. 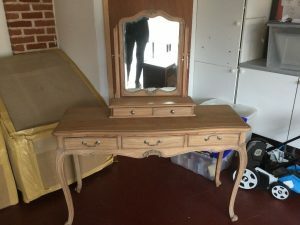 A solid wood vintage style dresser with brass handles. having a small removable mirror to above two small and three large drawers, on paw feet. 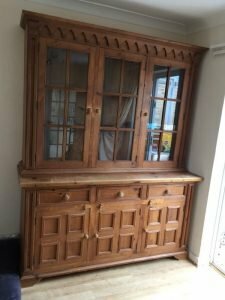 A tall standing solid wood and glass vintage display cabinet, having a double and single cupboard above three drawers and two smaller cupboards. 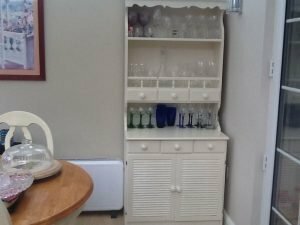 A hand painted white solid wood and tile kitchen dresser, having two plate shelves with seven cup holders above two small cutlery drawers. 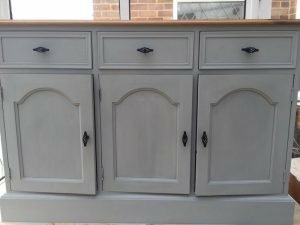 A hand painted grey solid soak vintage sideboard, having three drawers above a double and single cupboard. 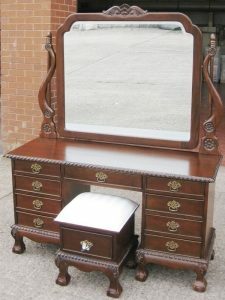 A solid mahogany heavily carved vintage style vanity dresser with a large mirror, together with a matching storage stool. 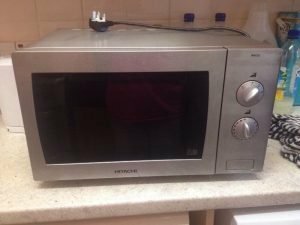 A Hitachi stainless steel and glass counter top 500w microwave. 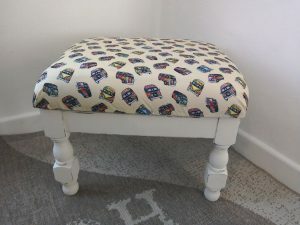 A hand painted white solid wood piano stool, upholstered to the top in mini van printed fabric. 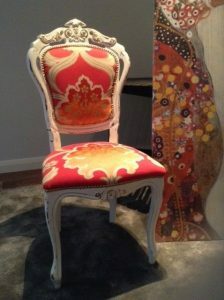 A vintage hand painted white heavily carved bedroom chair, upholstered to the seat and backrest in red and orange patterned fabric. 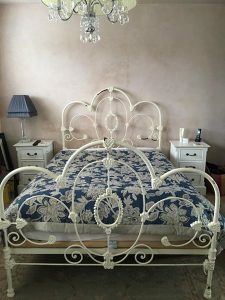 A hand painted white cast iron small double bed and mattress, together with two solid wood bedside drawers.